By far the BEST tasting lemon coconut cake there is! 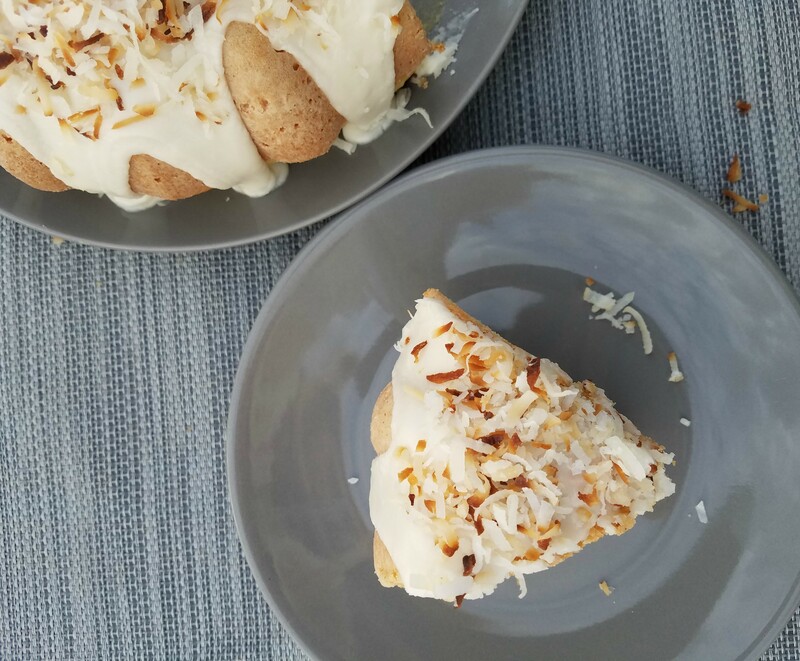 Delicious moist cake with a tangy lemon frosting and toasted coconut topping. Summer has come to an end. And I’m one sad Mom. It’s bittersweet to send them off each year knowing they (and I) are getting one year older. Each year comes with first of the year challenges. Some years are harder then others for them and they struggle or breeze through the year. Some years bring more tears than others. Some years take forever to finish and others fly by. But the celebration part of school for parents is that the kids are back to structure and order. The house stays tidier, the electronics left unplayed. The house echos and has an eerie sound to it. Gone are the fights, the food wrappers left on the floor and the endless stream of noise, opening and closing of doors and lights being left on. Now it’s strewn backpacks, school papers left carelessly around the house and making school lunches. And while the kids are back to order, the weather is still unbearably hot outside. And when it’s hot outside, I crave the flavors of summer. 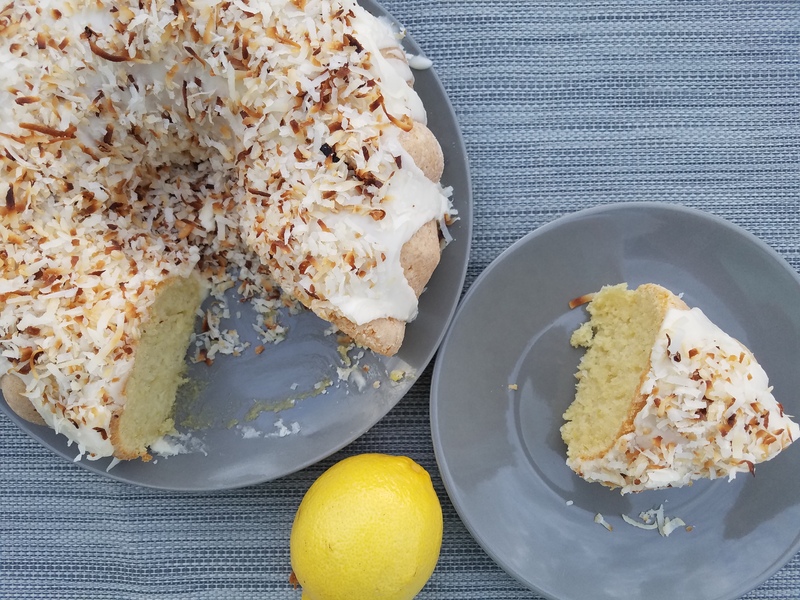 This lemon coconut cake is delicious! 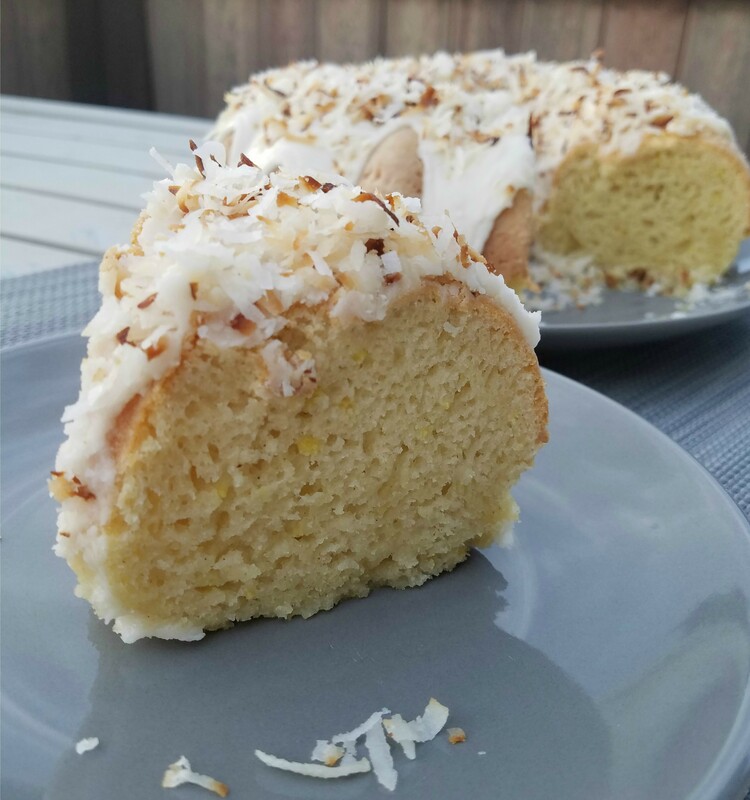 The cake is moist and has a nice undertone of lemon while the frosting is tangy and has a rich toasted coconut topping. It’s amazing! Now send those kiddos back to school and grab a slice of this cake to eat while relaxing and reading a book. After a summer of entertaining kids, you’ve earned it! (add 1 tsp xanthum gum if using gluten free flour blend and gf flour does not have it in the mix). Preheat oven to 350 degrees. Lightly grease and flour a bundt pan. In another pan, whisk together the dry ingredients. (flour, xanthum gum (if using), baking powder and salt). Turn mixer to low, slowly add in the flour mixture. Add in the milk and oil ,continuing to stir until mixture is smooth. Pour into the bundt pan, cook at 350 degrees for 35-40 minutes. Remove from pan when cake lightly springs back when touched and a toothpick inserted in the center comes out clean,. Remove from heat and allow cake to cool in pan for 5-10 minutes before inverting the pan and removing the cake to a cooling rack to finish cooling completely. Frost once cake is at room temperature. Stir together the lemon juice, powdered sugar, and melted butter in a bowl until smooth. Add additional lemon juice if needed. Drizzle over the top and sides of the cake, then top frosting with toasted coconut.